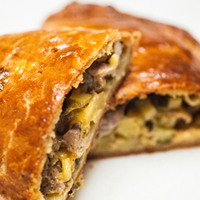 This recipe is like Belgian comfort food and a Sunday supper combined. 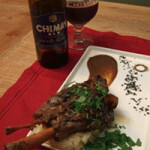 The lamb shank slowly braises in a mixture of Chimay Grand Cru, dried figs and spices, giving your kitchen (and house) a decedent aroma that warms the house. 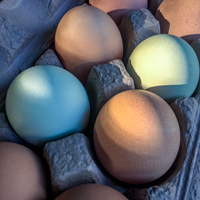 Try this recipe for a dinner party, when you want to impress your guests, as it can be made ahead and kept warm in 200°F/93°C until ready to serve. 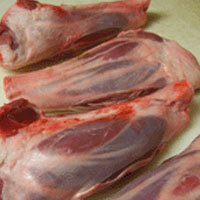 Wash each lamb shank under cold water to remove any blood or fat and pat dry with paper towels. 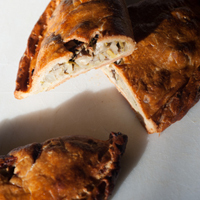 Sprinkled each with salt, pepper and flour, coating evenly on all sides. 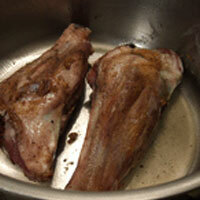 Place a dutch oven or large sauté pan, over medium heat, add oil and 2 lamb shanks. Brown evenly on all 4 sides, about 4 minutes per side. Remove and repeat with remaining shanks and set aside on a plate. Add more oil if need to the pan to sauté add carrots, celery, leeks, shallots and cook till the vegetables are slightly browned, about 5 minutes. Deglaze the pan with chicken stock, removing any of the fond with the edge a wooden spoon. Add thyme, figs, brown sugar, coriander, cloves and cinnamon stick, mixing well. At this point you have two options to cook the lamb shanks. 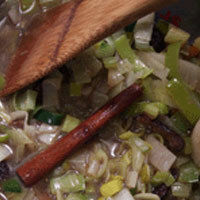 You can add this mixture to a crock pot or continue with Option 2. For the Crock Pot Method, depending if the shanks are going to be cooked the same day or prepping them for the following day. If the shanks are going to be cooked the same day, add the browned shanks to the bottom of the crock and arrange so that they are in one layer. Then top with the sautéed vegetables. Pour the bottle of Grand Cru on top. Cover with its lid and cook on high for 7 hours. 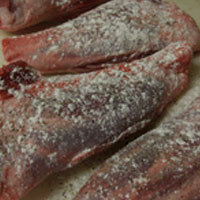 If you are going to cook the lamb shanks the following day, chill all the ingredients and store in the refrigerator. 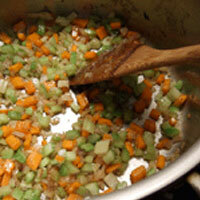 The next day, take the vegetables and warm them over low heat. 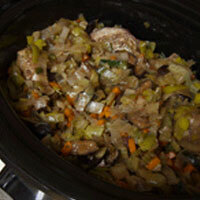 Place the lamb shanks in the bottom of the crock pot in an even layer. Add the warm vegetables on top of the lamb and pour the Grand Cru over it all. Cover and cook on high for 7 - 8 hours, as the lamb might take longer to warm up. 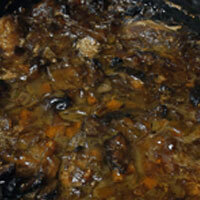 Add the browned lamb shanks back to the pot, nestling them into the vegetables and top with the Grand Cru. Bring the whole mixture to a low simmer. Cover the pot with a lid, turning the heat off and place into the middle of the oven for 3 hours or until the meat is almost falling from the bone. The lamb should be fork tender and the house should smell good. Carefully remove the lamb shanks, keeping the meat intact with the bone and place on a large plate. For the remaining liquid, a sauce can be made two different ways. 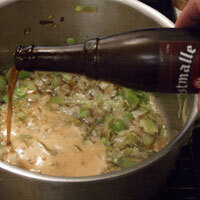 One option is to strain the vegetables, removing them from the stock/beer and place into a sauce pan over low heat. Simmer till the liquid has reduced my half, taste and adjust seasonings and pour on top of the meat. The second sauce option is to remove the whole spices from the braising liquid, then pour into a blender or food processor and purée until smooth. Strain the sauce through a strainer (helping to make sure all the spices were removed and any chunks left behind), into another bowl. Season to taste with salt and pepper; adding a teaspoon or more of malt vinegar or red currant jam to brighten the sauce and to adjust the sweet/sour balance. 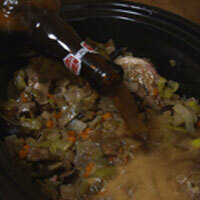 If the sauce is too thick, adjust the consistency with more stock or beer. Serve the sauce with the shanks and the Potato Parsnip Puree would be a perfect compliment to the dish, pulling out the spice flavors in the sauce, blending with the rich nuttiness of the parsnips. Serve the sauce with the shanks and the Potato Parsnip Purée would be a perfect compliment to the dish, pulling out the spice flavors in the sauce, blending with the rich nuttiness of the parsnips. Chimay Grande Reserve (Cru) or Blue has notes of dried fruit, plum, fig, some spice from the yeast, maybe cinnamon, toffee and caramel from the grain bill. 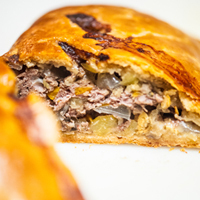 All these flavors play off the lamb, bringing out the rich meaty taste after the shanks have bathed in a long hot bath. Another beer I’d recommend is Rochefort 10, having some similar flavors with dried fig, plum, yet having a drier finish. A homebrewed Grand Cru would also be worthy of a dish as this. All the above beers would be my first choice to pair with as well.